“True peace is not merely the absence of tension, it is the presence of justice” - Martin Luther King, Jr.
Today is Martin Luther King, Jr. Day and NCG’s recent trip to Selma and Montgomery, Alabama makes this day particularly relevant in connecting Dr. King’s fight for racial justice to our current political times. As I entered into the National Memorial for Peace and Justice I was greeted by the above quote on a wall of wooden slats that let in the sunlight on the cold day when we visited. 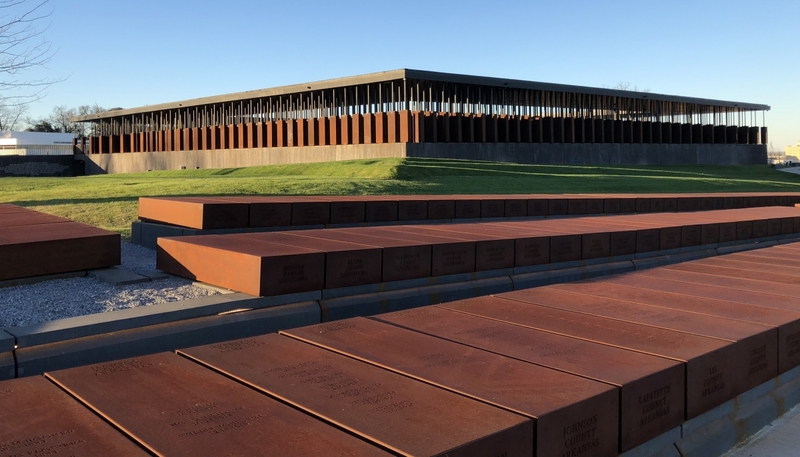 I walked through huge steel monuments engraved with 4,400 names of African-American men, women, and children who were lynched between 1877 and 1950. Earlier that day, our group went to Selma and we sat in the Brown Chapel where we heard stories from two participants of the Selma to Montgomery marches. They shared stories from their teenage years as “foot soldiers”, with elders who strategized to fight for their right to vote. I felt the gravity and the awe of being in that church where Dr. King preached and others congregated and sang freedom songs to comfort and inspire them in their activism. Bryan Stevenson, the founder and Executive Director of the Equal Justice Initiative, shared the story behind the creation of the National Memorial for Peace and Justice and the Legacy Museum. He had visited the Memorial to the Murdered Jews of Europe in Berlin and the Apartheid Museum in Johannesburg and thought that in the U.S., we didn’t have a memorial for the victims of white supremacy. Mr. Stevenson created an experience to confront Americans with the history of enslaved Black people and their lynching, to shift the narrative toward racial equity. By facing the stark reality of racial terror and talking about it, we can begin truth and reconciliation. Truth and reconciliation are components of the W.K. Kellogg Foundation’s Truth, Racial Healing, and Transformation efforts which also includes their third annual National Day of Racial Healing, taking place on January 22. NCG is participating in the National Day of Racial Healing along with Southern California Grantmakers, who is one of Kellogg Foundation’s 14 anchoring collaborations focused on racial healing and transformation. As we tie the lessons from Montgomery to Dr. King’s invocation that we move beyond the absence of tension, through to Bryan Stevenson’s invitation to confront our history with slavery and lynching, I offer these recommendations. You can choose from the personal, professional, and the political because there are multiple ways to practice racial healing and to aim for Dr. King’s vision of justice. Take some time to connect with others, whether in your family, your workplace, or community to have conversations about race and racism and help normalize sharing these kinds of stories. Volunteer with an organization that address the needs and issues of communities of color and be in collective action for racial equity. Think about your organization’s internal and external work to promote diversity, equity, and inclusion? Are there areas to improve the work of your organization and opportunities to raise DEI concerns with the staff and board? What do you need to have this courageous conversation within your organization? NCG can help you identify ways to have this conversation and do this work. There are many opportunities to participate and to practice being a promoter and ally for racial justice. Read this article, This is what an anti-racist America would look like. How do we get there? by Ibram X. Kendi. Attend the Othering and Belonging Conference April 8-10 in Oakland, organized by the Haas Institute for a Fair and Inclusive Society.